Fundamental data, which has been issued by European Bureau of Statistics this year, does not contribute to the growth of European currency. Volume of private lending in Eurozone fell by 2.3% on annual basis, which is the lowest index in 20 years. Despite measures of the monetary authorities, business activity in European countries continues to decline; therefore we cannot count on the rapid recovery of economy. The key news of today is as follows: unemployment rate in Germany and consumer price index in EU. 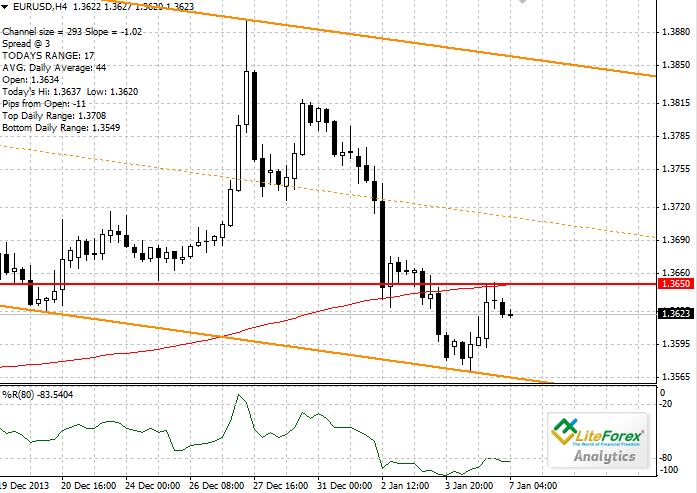 On Monday the pair EUR/USD failed to overcome important resistance level of the moving average with the period 200 and since then has traded downward. However, the level of 1.3650 is still the target of the “bulls”. If Euro manages to consolidate above this level in the near future, the pair may grow up to the level of 1.3745. The nearest support level is 1.3600. “Bearish” trend is strong in the market; therefore it is recommended to open short positions after breakdown of support level of 1.3600 with protective orders near 1.36200 and a target of 1.3511.